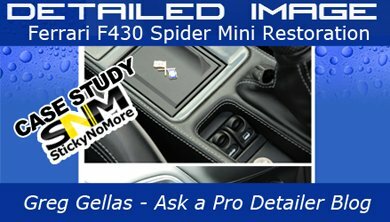 We offer a unique refinishing process to make worn interior parts look better than new. Our process involves stripping the parts clean, prepping them, and refinishing with a fresh hard coating. Unlike many soft coatings, our coating will not fade, bubble, ripple or get sticky. The color of the refinish is very close to the original parts. We guarantee that the parts refinished by StickyNoMore will not fade, bubble or get sticky for as long as you own the car. Turnaround time usually takes about 10-14 days. We work diligently to get the refinished parts back to you as as quickly as possible. You may check the status of your order here. 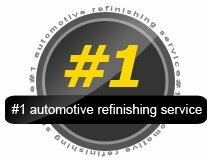 We are the #1 automotive refinishing service in the world. We constantly strive to offer a product that is unbeatable, with customer service to match. We fully stand behind the quality of our work and offer a lifetime guarantee. 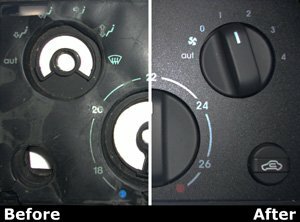 After purchasing a Ferrari 355 F1 Berlinetta, we began to notice that the a/c dash vents and switches were getting rippled, and looking sticky. We researched dealers, shops, etc., only to find expensive new replacement parts. Then we began a quest to find a solution to this problem. After countless hours of legwork, thousands of dollars spent and many sleepless nights, we finally found the answer. A beautiful refinishing process that suits the luxury interior. Thank you for supporting us and making StickyNoMore what it is today. We would like to take a moment to remind everyone to carefully inspect all parts for quality within 10 days of receipt. If you have any questions or concerns please contact us immediately.